Friends should always stick together. 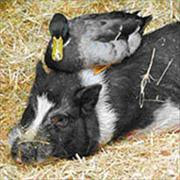 That’s what the Humane Society believes about Potato the Pig & Henry the Duck, two survivors from a sad animal neglect case here in Oregon. These two critters, along with another pig, were apparently raised together, so the hope is the three friends will be able to stay together in one new home. I’ve always been fascinated by pigs…if I could offer a good home to two pigs and a duck I’d be heading over to the shelter now! Visit the Oregon Humane Society for more information about this special group of closely bonded friends.